One of the most abundant bivalve molluscs on the mud- and sand-flats of eastern and southern Australia, the Mud Ark can reach a shell length of almost 70mm. Typically it lives partially buried in the sediment, often in Zostera sea grass beds. The animal, like certain other ark species has red blood due to the presence of haemoglobin – a more efficient oxygen-carrying molecule for animals inhabiting low-oxygen environments such as mud. Shells of Mud Arks are common components of Aboriginal shell middens indicating their long-time importance as a food resource. 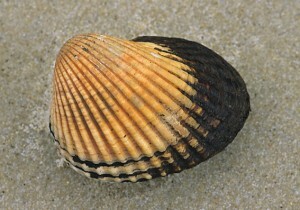 Living and fresh-dead specimens exhibit a dark ‘skin’ (periostracum) on the surface of the shell, soon lost once the separated shell-valves erode. Indigenous: South-western to eastern Australia.